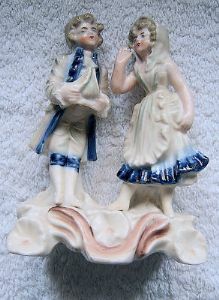 This is a highly collectable STAFFORDSHIRE Figurine Set of a young boy and girl chatting closely to each other. They are set on a raised platform. This particular offering represents a product manufacured in the early 19th. Century- it has an impressed number of 2242 on the back of the base. The figures stand 4.75 inches (12 cms) tall with a width of 3.5 inches (9 cms).